S3SS10N Wednesdays are our weekly 15 minute lessons put together by Instructors and Cybrary Staff to offer you valuable information relevant to your life. Every Wednesday morning (Eastern time) a new session will be available for you to view, read, and discuss with others. Make sure to come back weekly and see what’s new! Instructor Dean Pompilio has been in the IT field since 1989 and has both US and international experience working in the banking and credit card industries. After spending most of this life in Chicago, he came to the Washington, DC area in 2005 and has worked with the Department of Justice as well as the State Department in senior analyst roles as well as The World Bank. He took on a teaching role to share his experience both from an IT perspective as well as an educator. You can view his (1.5 minute) bio here. A Pen testing lab is a great way for programmers to begin learning about the kind of technology that is available in this field and there are many advantages to having your own lab in that not only is it portable; always having access allows you to practice and learn as much as you desire. This video offers participants step by step instructions in how to build an all in one, complete testing system and everything is virtualized so it’s on one device such as a laptop. Virtual machines are strong for this purpose because they are secure as long as you are careful with the network settings. Building a virtual machine isn’t hard as long as you possess the right tools, starting with a powerful laptop with a minimum of 8 GB of RAM and then begin downloading VM building tools to start building your lab. 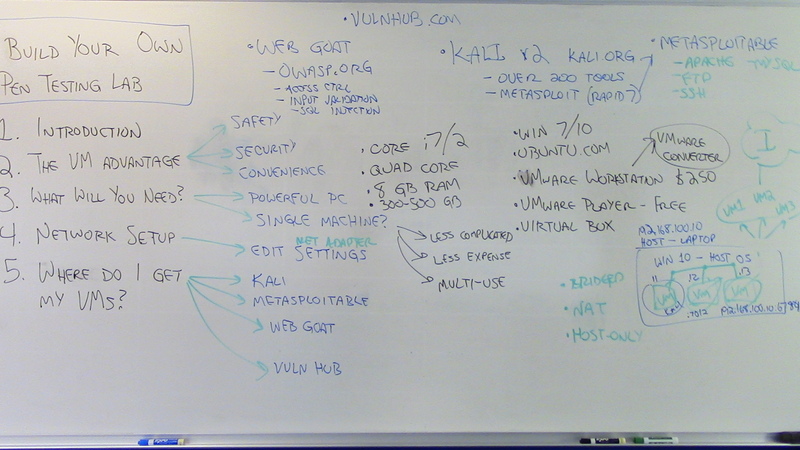 Finally, the instructor talks about KALI and Web Goat, which are free and powerful tools that can be used to build a virtual machine. Participants can also found vulnerable virtual machines on vulnhub.com, these tools give participants a chance to practice their techniques.